Abstract : The status of the development of the porcelain vacuum vessel is described. Difficulties and improvements carried out and planned are also described. A prototype of the vacuum vessel has been moulded. It is a slice of the whole toroidal shape. The photo of the porcelain prototype is shown in Photos 1. 2. 3. Some difficulties, describe below, have arisen. The objective of this prototype is to improve the components of the porcelain paste, achieve very low porosity, detect possible problems during baking and other tests. 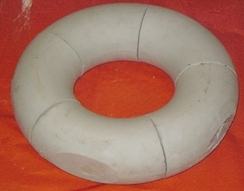 A plaster torus composed by 5 pieces has been built, see Photo 4. The non-protuberant port  has been simplified and now it is practically a plane surface with a small flange to allow easy polishing. At the moment the plaster torus is waiting for the test of the prototype. If the prototype fulfil the specifications (porosity-water retention, enough small deformation, etc) the plaster torus will be finished, the mould created and one or several porcelain torus produced. The first piece of the prototype of vacuum vessel cracked when baking at 1280 ºC. This could be due to the short baking period, about 3 hours. A more normal period lasts 8 hour. The addition of other components to the standard paste in several proportions, like feldspar, is in process. It should increase vitrification and decrease baking temperature for the same porosity of the final piece. 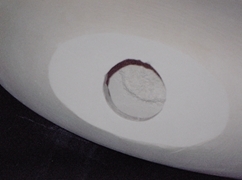 The plaster torus will be improved if the porcelain prototype finally succeeds. The present accuracy of the torus is +-1 mm due to imperfections of the original 1/5-torus metallic piece. a) Rectify the plaster with a lathe specially designed for toroidal shapes. b) Create a new plaster torus with a special device that can conform a half (cut at the equatorial plane) accurate torus from wet plaster. The above development would be impossible without the help and work of Jorge Ramos, ceramic technician and Lola Torres, ceramic artist. "FE stress analysis for a first outline of the vacuum vessel of UST_1" . Vicente Queral , See "All past research" in this web. Photo 1 . Porcelain prototype. This is a slice of the torus. Photo 2 . Porcelain prototype. This is a slice of the torus. Another view. Photo 4 . Five pieces of the torus before sticking and rectifying. 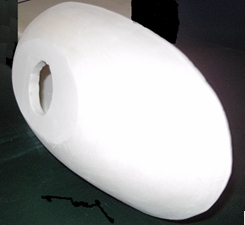 This plaster piece has an external diameter of 330mm.